African armyworm | Infonet Biovision Home. Armyworm identification. The caterpillars can eat the entire leaves of field crops and grasses. When feeding, they chew from the leaf edges until only the midrib is left. They feed on various crops and grasses during their migration, and often bare crops of tender leaves after passing through. They travel from field to field in great numbers, hence the name "armyworm". 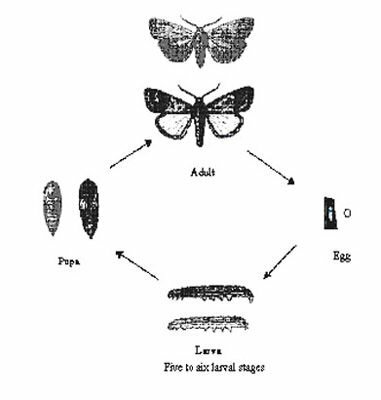 Lifecycle of armyworm 10 to 300 eggs are laid by an adult female moth, on the leaves. The eggs are white and become dark brown just before hatching (about 0.5 mm in diameter). Armyworm, adult male moth S. exempta (museum set specimen). 1.4 to 1.8 cm long and with a wingspan of about 3 cm. (c) Georg Goergen/IITA Insect Museum, Cotonou, Benin. Reproduced from the Crop Protection Compendium, 2004 Edition. 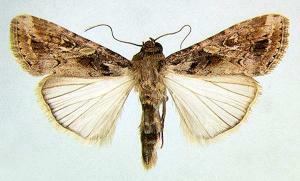 Armyworm, adult female moth (S. exempta) (museum set specimen). 1.4 to 1.8 cm long and with a wingspan of about 3 cm. Armyworm, adult moth - line drawing. Stout-bodied moths of typical noctuid appearance, 1.4 to 1.8 cm long with a 2.9 to 3.2 cm wingspan. (c) Dennis S. Hill. Reproduced from the Crop Protection Compendium, 2004 Edition. Armyworm, life stages - line drawing. Egg ca 0.5 mm diameter, conical with a slightly rounded apex. Gregarious larvae with velvety-black upper surface with pale lateral lines, green or yellow ventral surface. Pupae mahogany-brown, 10 to 14 mm long, with a smooth, shiny surface. Armyworm, adult and caterpillar - line drawing. The pupa is red-brown and is approximately 2 cm long. Adults have a wingspan of about 3 cm. The African armyworm is a migratory moth, the larvae (caterpillars) of which are important pests of pastures and cereal crops, predominantly in Africa south of the Sahara, Yemen, and certain countries of the Pacific region. Normally, only small numbers of this pest occur, usually on pastures. However, periodically the populations increase dramatically and mass migration of moths occur, covering many thousands of square kilometres and traversing international boundaries. They travel from field to field in great numbers, hence the name "armyworm". Outbreaks follow the onset of wet seasons when dry grasslands produce new growth and cereal crops are planted. The severity and extent of outbreaks are increased by extended drought followed by early season rainstorms, which concentrate egg-laying moths and provide flushes of new grass as food for newly hatched caterpillars, and dry and sunny periods during the caterpillar development, which promote survival and rapid development. Therefore, major upsurges occur in seasons of sporadic rainstorms and long sunny periods throughout the outbreak period. Caterpillars are major pests in outbreak years, causing significant losses on a local, national and regional scale. During outbreaks, caterpillars occur in such high numbers that they have to travel in masses from one field to another in search of food to complete their development, devastating crops as they move. Significant losses are most consistently reported from eastern and southern Africa. However, in recent decades, the frequency of reports from West Africa has increased, possibly due to the extension of suitable grassland habitats following forest and bush clearance for agriculture. The economic importance of the African armyworm is due to its rapid development (short life cycle), high reproductive capacity, and mobility by migration. Moreover, there is little time to react as infestations frequently go unnoticed, since young caterpillars are difficult to detect. When caterpillars become conspicuous (at the fourth instar), they cause a lot of damage in a very short time. In areas with high and localised rainfall during armyworm seasons, plants can regenerate provided the growing tips are not damaged, with little or no yield reduction. In contrast, in areas of erratic rainfall, farmers may lose their crop completely. The degree of damage by armyworms varies from year to year. In East Africa, a severe outbreak can cover several square kilometres at very high densities, while in non-outbreak years, caterpillar density is often low, and the size of attacked areas is negligible. The first armyworm outbreaks appear in Tanzania and Kenya, and are serious in nine years out of ten, causing up to 90% losses of crops and pasture in bad years. They covered 157,000 hectares of crops and pasture in 2001. 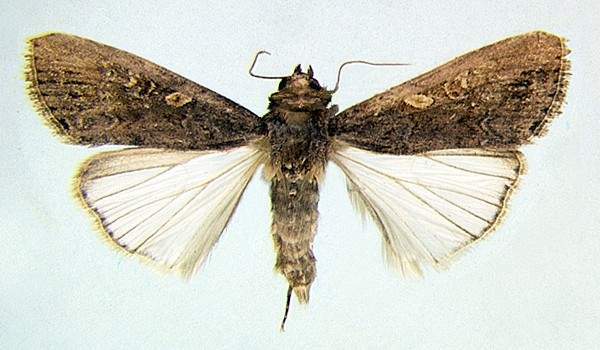 In major outbreak years the moths subsequently migrate to cause extensive damage in Uganda, Ethiopia, Somalia and Eritrea and may travel as far as Yemen, or south to Malawi, Mozambique and Zambia. Grasslands, even maturing crops can be totally destroyed. If drought conditions follow an outbreak, plants may not recover from defoliation and replanting may fail to produce a crop. Damage to cereal crops results principally from attack on young plants by young caterpillars hatching or dispersing into the crop from adjacent wild grasses. Weed-free maize crops taller than 50 cm are unlikely to become infested by newly hatched caterpillars because the leaves are too tough to allow them to establish. However, when older caterpillars moving from heavily infested grasslands invade fields, even maturing crops can be totally destroyed. Reported yield losses caused by defoliation in maize range from nine percent in plants attacked at the early whorl (four leaves) stage to 100% in those damaged at the pre-tassel stage. The ability of young maize plants to recover from armyworm damage depends on the position of the growing point at the time of attack and the amount of root development when the caterpillars stop feeding. Damage is always serious if the growing point is affected but, as it remains at the base of the plant until near to the pre-tassel stage, it may be below ground during the outbreak and remain undamaged. Replanting maize after armyworms have destroyed the first-sown plants is frequently unsatisfactory, as the optimum planting dates will have been missed. Yield losses of 6% have been estimated for each day's delay after the optimum planting date in high-rainfall areas in Kenya. Late planting may result in much higher losses in areas with less rainfall; yield losses of up to 92% have been recorded in such areas in Malawi and Kenya. If drought conditions follow an outbreak, plants may not recover from defoliation and replanting may fail to produce a crop. In sorghum, millet, rice and teff, armyworm damage may stimulate growth of tillers (lateral shoots on or just under the surface of the ground), which can increase yield in favourable conditions. If subsequent rainfall is adequate for crop growth and development, yield losses may be limited, providing the damage occurs before the critical grain-initiation stage has been reached. Damage to pasture and rangeland can be extensive and severe. Good rainfall after infestation is an important factor in pasture recovery. In Kenya, vegetation changes in infested pastures have been reported to persist for many years before good grass cover has been restored by management of dicotyledonous weeds. Indirect losses to livestock due to armyworm outbreaks in pastures are sometimes severe, due to a combination of starvation and poisoning. The latter occurs when cattle graze on pastures recently infested with armyworm. Deaths among cattle grazing recently infested pasture have been reported by herdsmen in southern Ethiopia, Somalia (where 100 cattle were reported to have died on one occasion), and Kenya, as well as in southern Africa. Speculations as to the causes of death include high cyanide levels induced in Cynodon grasses by armyworm damage, and ingestion of caterpillars or fungal mycotoxins on armyworm faeces. The plants attacked are mainly cereals, grasses and sedges (Poaceae and Cyperaceae families). Major economically important hosts are: barley, pearl millet, African millet, maize, oat, rice, sorghum, sugarcane, teff, wheat and pasture grasses, especially Cynodon and Pennisetum species. Caterpillars exhibit strong host preferences within the Poaceae (cereals and grasses); there are major differences between varieties of cereal crops in their susceptibility to attack. Armyworm has once been found causing serious damage to coconut seedlings and once to young tea and, during high-density outbreaks, non-host plants including tobacco and cotton may be eaten, though not extensively. Primary hosts: Sorghum bicolor (sorghum), Saccharum officinarum (sugarcane), Panicum miliaceum (millet), Oryza sativa (rice), Eragrostis tef (teff), Zea mays (maize), Hordeum vulgare (barley), Avena sativa (oats), Triticum spp. (wheat) and Zingiber officinale (ginger). Secondary hosts: Palmae (plants of the palm family), Rosaceae, Cyperus (flatsedge). Wild hosts: Eleusine coracana (Koracan), Poaceae (grasses), Cyperaceae (Sedges), Cynodon dactylon (Bermuda grass), Panicum maximum (Guinea grass), Pennisetum clandestinum (Kikuyu grass), Cynodon spp. (Quickgrass) and Pennisetum glaucum (Pearl millet). The symptom of African armyworm attack is gross feeding damage to foliage, growing points and young stems. Young caterpillars scrape out the tissue of one side of the leaves creating a 'window' effect; leaves may dry up and assume a scorched appearance. Older caterpillars feed on leaves starting at the margins and moving inwards, leaving the leaves with a ragged appearance. They may eat whole leaves leaving only the midrib. 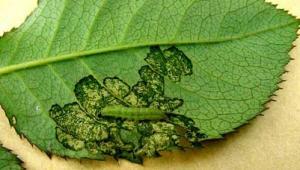 Severe infestation results in total defoliation or destruction of the plant to ground level. Older caterpillars drop to the ground if disturbed. With large populations the ground may be literally covered with the gregarious band of caterpillars. Flowering stage, fruiting stage, seedling stage and vegetative growing stage. Growing points, leaves and stems. Growing points: external feeding. Leaves: external feeding, windowing, ragged leaves. Stems: external feeding. In East Africa the lifecycle lasts about 25 days at an average temperature of 26degC. Eggs hatch in 2 to 5 days); larval stage lasts 14 to 22 days; pupal phase takes 7 to 15 days; and adults lifespan is 5 to 16 days. 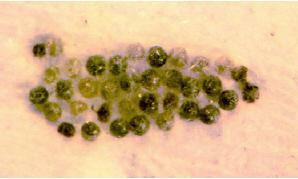 Individual eggs are almost spherical, slightly flattened, and about 0.5 mm in diameter. They are whitish yellow in colour when newly laid, but darken just before hatching. Female moths lay eggs at night in batches of 10 to 300 eggs in one or more layers on the leaves of the host plants, or sometimes on other surfaces (e.g. dry grasses, leaves of tall plants, twigs of bushes and trees, or on buildings). The egg mass is covered with black hairs from the female. The eggs hatch after 2 to 5 days, depending on temperature. Caterpillars occur in two principle forms: the gregarious form characteristic of high-density populations and the solitarious form found at low caterpillar densities. They have a marked colour variation depending on density. Young caterpillars are green. Crowding of caterpillars results in changes in both their colour and behaviour, creating what appears to the 'untrained eye', to be two different species. Gregarious caterpillars (caterpillars growing crowded) become blackish as they grow. Fully-grown caterpillars are about 40 mm in length; they are velvety-black on the upper body surface with green, black, yellow and white lateral stripes. The underside of the body is green or yellow and the larvae do no have hairs on the body. The head is shiny-black. Gregarious caterpillars are very active and feed on the upper part of the plant avoiding shade. African armyworm. Mature larvae measure up to 4 cm. This is the gregarious form (caterpillars growing crowded). Solitarious caterpillars (caterpillars growing singly) are coloured in a variety of shades of green-brown or pink, with a pale speckled head. They appear fat, and are extremely sluggish, actively avoiding the sun and sheltering and feeding at the base of grasses. Armyworm caterpillars usually feed on cloudy days and at night. When armyworms are numerous and the food supply becomes depleted, caterpillars march in great numbers to find a new food source. During this time they may also be seen feeding during the day. Mature caterpillars burrow into the soil to pupate. The pupae are brown in colour right after pupation turning darker brown and finally almost black. They are 10 to 14 mm long, with a smooth, shiny surface, and are enclosed in a delicate cocoon of soil particles held together by silk. 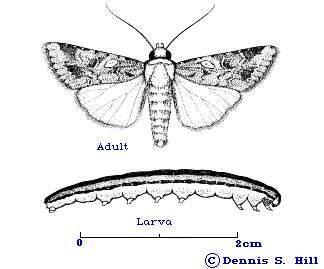 Adult African armyworms are stout-bodied moths, 1.4 to 1.8 cm long and with a wingspan of about 3 cm. Forewings are dark-brown with distinctive grey-black markings. Hindwings are white with dark veins. A related species, Spodoptera exigua (Lesser armyworm or beet armyworm) feeds not only on Gramineae but also on many other crops, including cotton, tobacco, tomato, groundnut and beans. Unlike S. exempta, this species does not migrate over long distances, but the caterpillars are gregarious and move in swarms. They are about 1.2 cm long with a wingspan of 2.5 cm. They are light grey with a small, round, light orange spot and a small, kidney-shaped spot on the forewing. Newly hatched caterpillars are light green with black heads. The fully grown caterpillars are about 3 cm long, light green to dark brown with conspicuous stripes along the sides of the body. Figure 3: Eggs at 'pinhead stage' (about to hatch). Figure 5: Advanced larval stage. Figure 6: Fully grown larva. 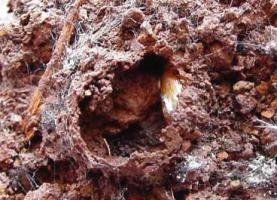 Figure 7: Pupal cell in soil: note pupa inside the cell. Close-up of pupa (inset). 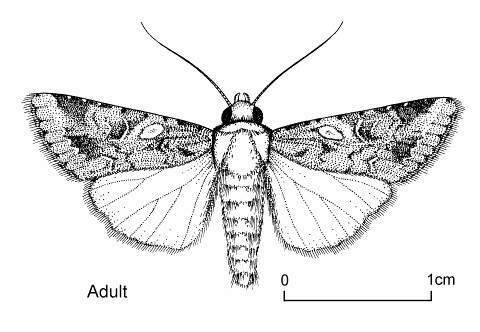 A female moth (Figure 1) can lay 500 - 600 eggs, in clusters of 50 - 150, covered with scales and hairs, which gives them a woolly appearance (Figure 2). Eggs are greenish cream coloured when freshly laid turning dark in colour before hatching (Figure 3). The eggs hatch after 2-4 days depending on temperature. 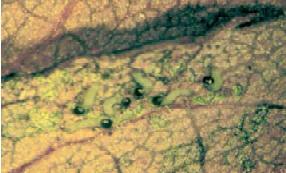 Newly hatched caterpillars are about 1 mm long, light green in colour with black heads (Figure 4). 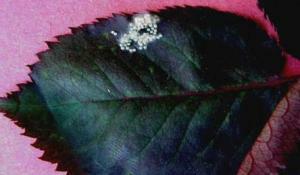 Young larvae feed on the underside of leaves, causing characteristic 'windowing' (Figure 5). The fully-grown caterpillar is about 30 mm long, light green with conspicuous stripes along the sides of the body (Figure 6). The average larval period is about 11 days. 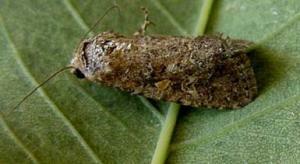 The larvae pupate in the soil (Figure 7) and the adult moth emerges after about six days. To monitor the presence of armyworm, conduct visual inspection by going around all your fields. Armyworms feed at night and hide under debris during the day. Solitary forms are usually sparsely distributed and difficult to find. 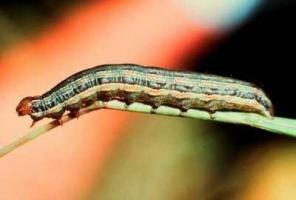 Consequently, armyworms are not usually noticed until severe damage occurs. Regular monitoring is vital for timely action. Look in field margins, low areas where plants have lodged, beneath plant debris around the base of plants, on the ground, and underneath the plant leaves. If conditions are known to be favourable to the pest, a close watch daily should be kept on grassland and young cereal crops. The earlier the infestation is noticed, the more effectively can control methods be carried out. A recommendation for monitoring armyworms is to examine 100 plants at random by examining 20 plants from five locations. Tentative nominal action thresholds for control measures have been determined for maize. To avoid yield losses of over 15%, action thresholds for early whorl maize should be taken as 200 second (L2), 80 third (L3), or 20 fourth (L4) instar caterpillars per 100 plants. Serious damage develops rapidly once caterpillars reach the L4 stage (CABI, 2000). As a general rule, control measures for the protection of pasture are not recommended unless caterpillar densities exceed 10/m2 (CABI, 2000). Control of armyworms is a large-scale venture and requires international collaboration. It usually involves early warning based on light traps or pheromone catches, or forecasts based on prevailing meteorological conditions. Accurate monitoring and prompt reporting of armyworm outbreaks is essential for forecasting and control. A forecasting system for armyworms has been in operation in East Africa since 1969. National crop protection services have departments with special responsibility for control of migrant pests, including armyworm, such as the Plant Protection Services in Tanzania and the Crop Protection Branch in Kenya. In Tanzania, the National Armyworm Control Programme based at Tengeru-Arusha, runs a network of traps distributed throughout the country. Farmers are advised to inspect their fields for signs of infestation immediately the forecast warns of expected outbreak in the area. Recently, a community-based monitoring system has been implemented successfully in several high-risk districts, where armyworm forecasters have been trained to monitor male moth numbers through the use of pheromone traps (Mushobozi et al., 2005). In Kenya, radio dissemination is provided by Kenya Agricultural Information and Resource Centre. The Desert Locust Control Organization for Eastern Africa (DLCO-EA) and the International Red Locust Control Organization for Central and Southern Africa (IRLCO-CSA) have regional responsibilities for armyworm. Armyworm attacks are notifiable in the region. 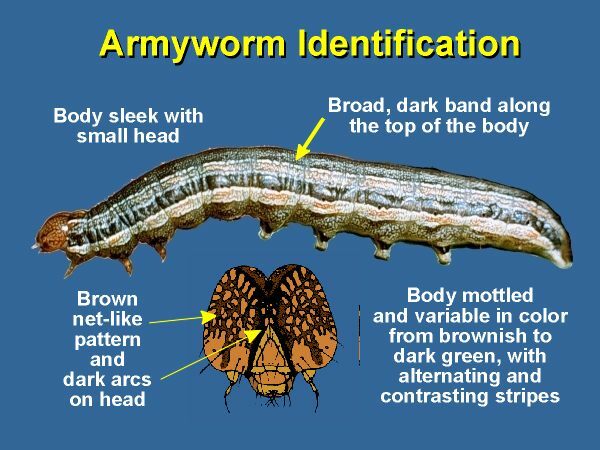 This means that if anyone spots armyworms, it should be reported immediately to the authorities (Ministry of Agriculture/ National Crop Protection Services), which will then send an eradication team, depending on the severity of the outbreak. Listen to radio announcements to prepare yourself for armyworm outbreaks. Cut grass weeds from bordering fields. Remove weeds regularly to reduce breeding sites and shelter for armyworm. However, if fields do become infested leaving grass weeds until the caterpillar have pupated or been controlled may help to reduce damage to the crop, since caterpillars may feed on weeds. Remove all plant debris after harvesting. Some maize varieties are more susceptible to attack than others, e.g. Katumani, a dryland variety grown widely in Eastern Kenya. These varieties are most at risk where probabilities of armyworm infestation are high. Plough and harrow field thoroughly. Turning the soil exposes armyworm pupae to desiccation and natural enemies. Avoid burning and overgrazing of grasslands, which are the natural habitat and food store of the caterpillars. Burning often causes outbreaks because as soon as temperatures rise, eggs are laid in large quantities on the fresh new grass. No oviposition occurs at temperatures less than 20degC. Also if their natural habitat and food is unavailable they will attack other crops (HDRA). An outbreak is more likely to occur if crops have been fertilised with high quantities of nitrogen as this causes green, sappy growth, which is very attractive to armyworm caterpillars. Natural enemies should be encouraged by maintaining natural surroundings with plenty of breeding places for them, including trees and shrubs. Lacewings, predatory wasps, parasitic wasps, flies, and spiders attack armyworm caterpillars. Night birds and bats feed on the African armyworm moths. Birds (storks and crows) may decimate small outbreaks but have little influence on larger ones. Armyworms are also attacked by viruses and fungi. In some instances, viruses have been known to cause armyworm populations to crash within a few days. Armyworm caterpillars infected with a virus appear limp and hang from plants after they die. A nuclear polyhedrosis virus, specific for the African armyworm (SpexNPV), sometimes act as a natural control during outbreak of caterpillars. First armyworm outbreaks of the season may be virus-free, but this virus may eliminate later outbreaks, mortalities of over 98% being frequent. Widespread virus attack is often associated with overcast, cool, wet weather. The main problem with NPV is that it generally spreads too slowly, and it arrives too late to prevent crop loss. 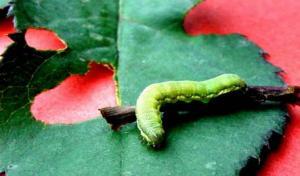 However, NPV can be sprayed like other pesticides, and once sprayed the virus spreads and multiplies in the armyworm. To be effective NPV has to be sprayed on to very young caterpillars (during the first few days after hatching) so it is vital that information about outbreaks is gathered quickly. This requires early warning of outbreaks, through regular monitoring of moth numbers. A joint project to develop alternative, non-chemical technologies for the management of the African armyworm between the Tanzanian government and the UK's Natural Resources Institute (NRI) was initiated in Tanzania in 1999. The project has developed a system to mass-produce NPV cheaply and a community-based armyworm forecasting pack, which is now being promoted more widely, and decision tools. (Earth report 6, Mushobozi et al, 2005; New Agriculturist, 2006.). Another virus (Cytoplasmic Virus) is also an important pathogen, killing pre-pupae and pupae. Fungi and bacteria are thought to be of minor importance (Odiyo and Stickler, 1977; Rose et al., 1996). Also it is known that armyworms are attacked in nature by viruses e.g. Spodoptera exempta nuclear polyhedrosis virus (SpexNPV) and Cytoplasmic virus. Field trials proved that SpexNPV sprays at the rate of 1 x 10^12 occlusion bodies per ha were effective in controlling armyworms. Sprays were applied at the third instar stage. Natural Resources Institute (UK) and Pest Control Services (Tanzania) has developed a system for mass production of SpexNPV as a biopesticide. Information on the product is available on www.dfid.gov.uk. For more information on natural enemies click here. Biopesticides (including botanicals/plant extracts and microbials) such as Neem, Pyrethrum and Bt should be applied if larvae are at or above threshold levels and preferably when caterpillars are approximately 12 to 20 mm long, namely before most damage has occurred. Once caterpillars are mature, that means they are 30 to 35 mm long, they will have done most of their feeding damage and it would no longer be economical to apply a biopesticide. In Namibia, the quoted threshold is 25 armyworms per trap. Traps are checked weekly (Namibian Crop Pests No. 28). Biopesticides should be applied in the evening since armyworms prefer to feed at night. Precautions: It is important to follow all precautions and directions listed it on the label when using a commercial biopesticide (or a pesticide) and ensure that the product is registered for armyworms on the specified crop. Pay particular attention to the required water volume to be used. Best control is achieved when using the highest water volumes. This applies to pesticide and bio-pesticide use for all pests/crops. Trials carried out in Tanzania showed that both neem seed and leaf extracts could be used to kill armyworms. Even though neem extracts are as effective as SpexNPV and synthetic pesticides, their use is only practicable in small holdings.The high bulk of neem needed and high transport costs means it is not feasible to use it on a large scale. Fallen neem fruits are collected from underneath the trees. The flesh is removed from the seeds and any remaining shreds washed away. The seed is carefully dried in airy conditions (in sacks or baskets) to avoid formation of mould. When needed, the seeds are shelled, finely grated, and then soaked overnight in a cloth suspended in a barrel of water. Dosage: 50g of neem powder per litre of water. This solution is then sprayed on infested plants. Grind 500 grams (g) of neem seed kernels in a mill or pound in a mortar. Mix crushed neem seed with 10 litres of water. It is necessary to use a lot of water because the active ingredients do not dissolve easily. Stir the mixture well. Leave to stand for at least 5 hours in a shady area. Spray the neem water directly onto the crop using a sprayer or straw brush. About 20 to 30 kg of neem seed (an average yield from 2 trees), prepared as neem water can treat one hectare of crop.Neem water can be stored and will remain effective for 3 to 6 days if it is kept in the dark. Pick the flowers on a warm day when they are fully open. Pile them up into small heaps in the sun to warm through. Then spread them out to dry on thick mats in a shady area. If they are to be stored, they need to be kept in an airtight container in the dark. Light reduces the effectiveness of the flowers. Pyrethrum powder:Grind flowers to a dust. Use pure or mix with a carrier like talc or lime. Sprinkle over infested plants.Pyrethrum liquid:Mix 20g pyrethrum powder with 10 litres water. Soap can be added to make the substance more effective but it is not vital. Apply immediately as a spray. For more information on pyrethrum click here. Spray thoroughly, covering all the plant surfaces. Apply when larvae are less than 5 mm long or when the eggs begin to hatch. Bt works best on young larvae. In the hot tropics, it is more effective to spray Bt in the late afternoon as there are longer and cooler hours ahead. This enables Bt to remain longer surfaces of the leaves. Bt survives better in cooler temperature. Whereas, spraying in the morning provides a shorter and hotter environment. Do not mix the Bt concentrate with alkaline water (pH 8 or higher). Alkalinity reduces its effectiveness. To make the water acidic, add a few tablespoons of white vinegar in a gallon of water before adding Bt. For more information on Bt click here. Plough a deep ditch. Keep it filled with water. This method is helpful, when caterpillars are found to be moving towards your field from the adjacent fields. Use light traps. They can provide useful information about the population of moths and therefore of caterpillars. Light traps help to predict if there is going to be an outbreak. However, light traps attract many other insects, including other moths. 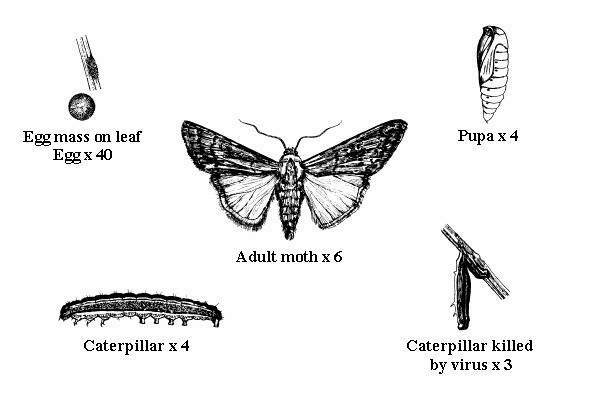 Therefore, it is very important to be able to recognise moths of the African armyworm. Use of light traps is primarily a tool in monitoring. In addition, a wooden tripod with a kerosene lantern is a ''light trap'' locally improvised. A tripod made of wooden poles (bamboo) is constructed with a lantern (kerosene) hanging in the middle over a bowl of water. The lantern is a fire hazard so the tripod must be secure, and the lamp must be hung so that the wood does not catch fire. 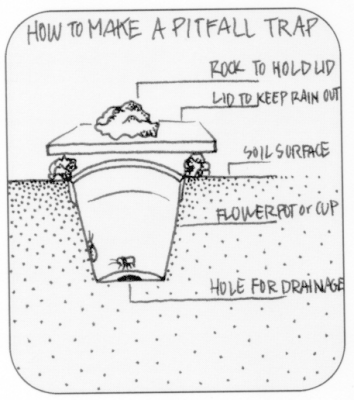 Pitfall traps are the best means of collecting crawling insects. Plant Protection Annual Report (1999). Ministry of Agriculture & Cooperatives Tanzania. Rose DJW, Dewhurst CF, Page WW, 1996. The African armyworm handbook. Nairobi, Kenya: Desert Locust Control Organisation for Eastern Africa.